You know that bag of apples still on the counter? The apples you should have eaten but didn’t? You hate to be wasteful and throw them away. But they have lost their tartness, and you don’t know what to do with them. Bake them. No, not in the oven. In the slow cooker. How do you bake apples in the slow cooker? Okay, maybe the slow cooker doesn’t have a baking selection. You can, however, use the appliance to cook apples that taste like they were baked. This recipe is good for one or two people. If baking for one, eat a serving and store the other in the fridge for later. Stay-at-home moms and wives can prepare this apple dessert and have it ready within four hours if cooked on high. Otherwise, cook it on low so it’s hot and ready as soon as you get home from work. 1/4 cup Lemon Honey (any kind of honey will do) Use 2 Tablespoons for less calories. 4 teaspoons Cinnamon Or shake liberally like I did. Peel then slice the apples. 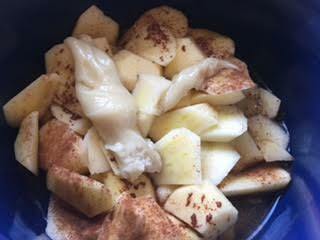 Put the apple slices into the slow cooker. Add the cinnamon, honey, and water. Put the lid on, and cook for four hours in the slow cooker on high (or for eight hours on low). If cooking all day, add another 1/2 cup of water. The nutrition values are estimated, not exact. You can cut a large portion of the calories out by eliminating the honey or using only half of what the recipe calls for. The two servings were great for my 21-Day Fix eating plan. However, I could have cut back on the amount of honey used. Those calories can add up quickly. I saved the juice and used it as a sweetener for green tea the next day. Amazing flavor! I just wanted to let you know that I cooked these all day on low, and we thought that the extra 1/2 cup of water was unnecessary. We had so much cooking liquid. I’m glad for your idea to make apple cinnamon sweet tea. It was delicious. Hmmm, how large is your slow cooker?